In Norway, Thursday through Monday of Easter are national holidays, and schools take the whole week off. I'm a master's student, and I get to do whatever I want, so I took the week off with my boyfriend Audun. A typical Norwegian Easter vacation involves driving to a cabin in the mountains to ski, generally accompanied by oranges and Kvikk Lunsj, a candy bar similar to a Kit-Kat. But we decided to go to west coast Norway to visit some of Audun's family. There was practically no snow it that part of the country this year, so we ditched the idea of skis and packed our mountain bikes instead. 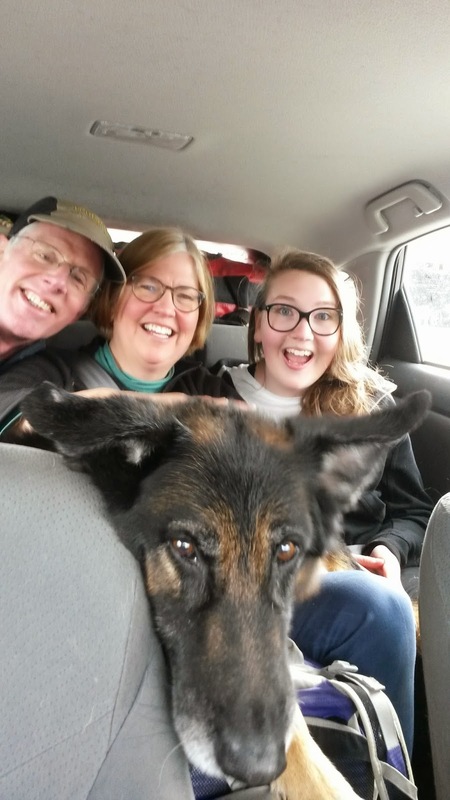 Dad, Mom, sister Zoe and dog. Looks pretty comfortable, right? Somehow, we made it through the 4 hour car ride still friends. I can, however, reveal that Priuses don't get great gas mileage if they are that overloaded! 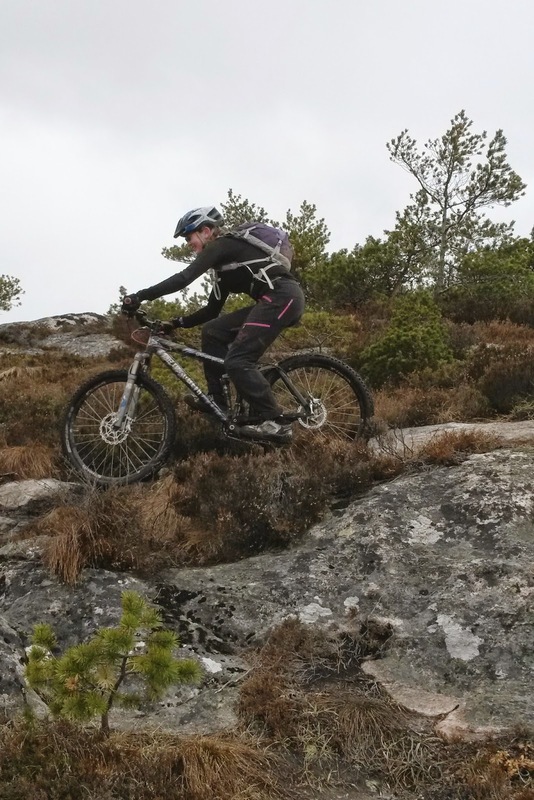 We checked in to Hotel Audun's Parents later that night, and the next morning decided to take a trip down memory lane and explore some of the trails that Audun grew up biking on. It was raining below 200 meters and snowing above, not my idea of fun biking weather. But living up to the Norwegian motto of 'there is no such things as bad weather, only bad clothes', we suited up in wool and GoreTex and headed out. Audun wheelies on the snow-covered ski trail. We climbed up the hill to a little ways above Tingvoll Museum when the snow reached a not-fun amount. Below the snow line, the forest was wet and slick, but the trails were good fun. The trail network took us all the way down to the fjord, quite literally. Journey's end at Tingvoll fjord. Except we have to climb back up now! The next morning we woke to 5 centimeters of fresh snow, with fat, sticky flakes still coming down. Oh the irony of a winter without snow, and as soon as we show up with the bicycles - BAM - bring the snow! 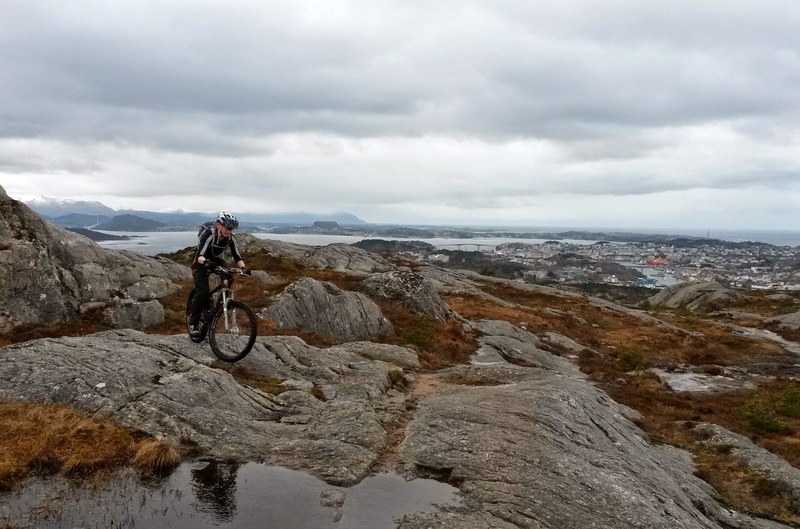 We were able to confirm that it was raining rather than snowing further out on the coast, so we packed up our bikes and drove a hour west to Kristiansund. Neither of us had biked there before, but but we found some promising GPS tracks on Strava. 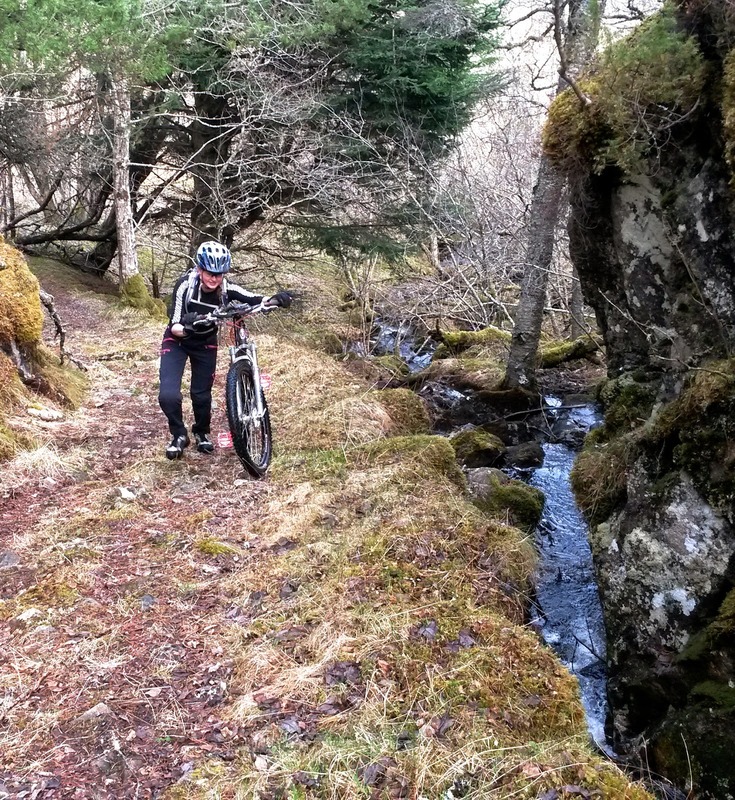 The first track we followed had us bushwhacking through a bog - clearly the person who rode here was out exploring rather than riding! The bushwhacking lead us to a trail in the end, and then back out to the road. Hike-a-bike after the bushwhacking was over. Wish I had taken pictures of the bushwhacking! Next we head around and then up Kvernberget, the hill that overlooks Kristiansund city. This time we were riding on an actual trail, although it was wet and boggy. Come to think of it, there are actually a remarkable number of bogs in coastal Norway. Wet feet are sort of inevitable on our bike trips. After biking around one side of Kvernberget, we followed the GPS track to the top. Although we were following a trail, it was steep and unbikable. Certain sections required carrying the bikes on our shoulders while scrambling up large rocks. Hikers with babies on their backs passed us. "The descent better be worth it," I grumbled. Eventually we reached the summit ridge and could start pedalling again. The descent was totally worth all the hike-a-biking. 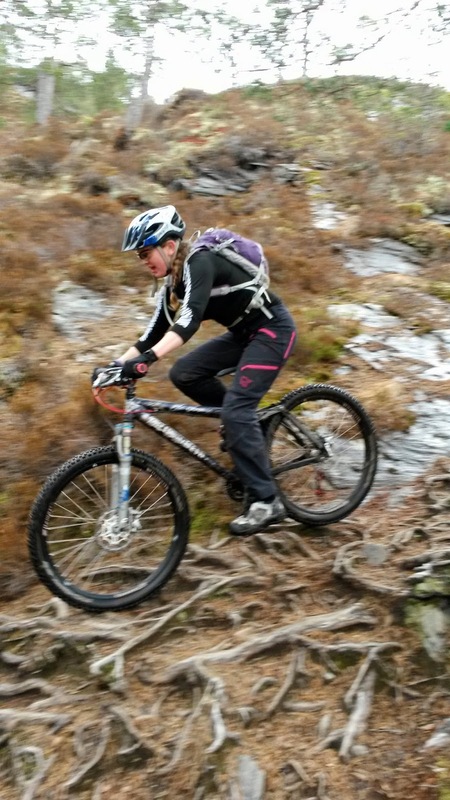 I was having a great day, which meant that the technical descent was fun rather than terrifying. Enthused by the trails so far (except the bushwhacking in the morning), I suggested that we grab lunch and try another trail. Over gas station paninis we agreed try the trail up to Drabovatnet lake on Frei, the neighbouring island (yes, Kristiansund is on an island). 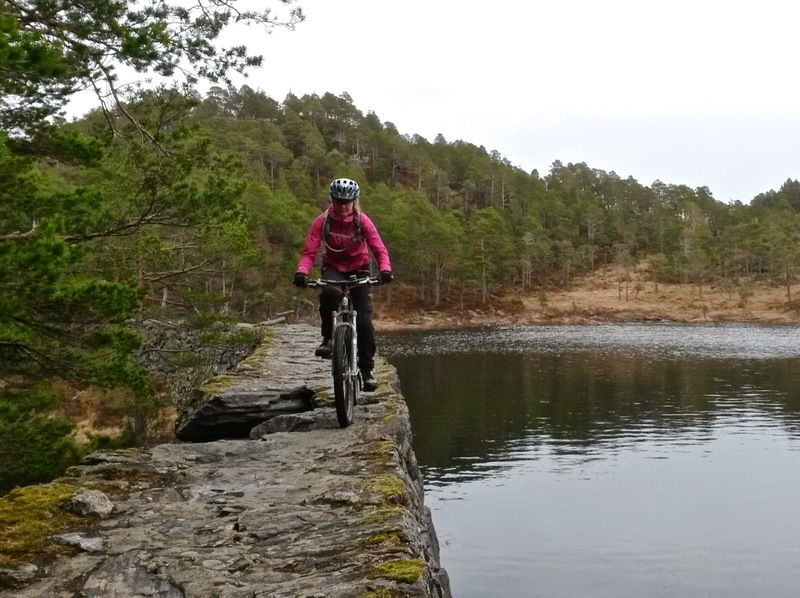 The trail to Drabovatnet was short but held plenty of technical challenges. And of course a few bogs. The lake was damed at the end with a rough, stone dam. Crossing the dam was honestly the scariest thing I did all day - I kept thinking I would spaz out and fall into the lake, bike and all! This picture is enhanced by the fact that you can't see the pained look on my face. We biked down the same way, and called it a day of good trail exploring. In the next episode: Audun and I are simultaneously blown off of a steep ridge on our bicycles! Come back in a few days for the full story.